I bought this on a whim. Lels as you see, I am fan of multi-purpose products, it makes me feel like I save up money. But hehe funny is that I am easily swayed by such promotion which leads me to buy more which is not saving at all. How ironic is that? Anyway for today I will be reviewing a product I got from Nature Republic, its Nature Republic Soothing and Moisture Aloe Vera 92% Soothing Gel which I call Aloe Vera Gel for short. When I entered their store I was welcomed by this in-store signage. 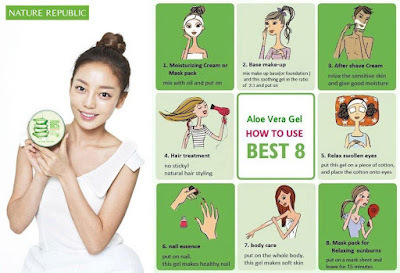 It is a soothing aloe vera gel with 8 uses. I really intend to use Nature Republic Aloe Vera Gel as a moisturizer. Crazy, I haven't tried the other uses but I will! I promise to update this when I am not as busy. I really like how non-sticky it is and it is easily absorbed by the skin. The scent is love love love! Its therapeutic~ <3 Just like how I expect this aloe vera gel should be! Its a total treat on the under eyes, especially now that its summer. Its very timely that I bought this as its an instant refreshing product to use after a long tiring day of work. I also use an exfoliant now but with the help of Nature Republic Soothing Aloe Vera Gel I bid the flaky skin goodbye! Nature Republic stores in SM. 300ml of product only costs P245. I am guessing that I will! A great aloe vera product. Nature Republic Soothing and Moisture Aloe Vera 92% Soothing Gel is my new favorite moisturizer. I am serious in getting back my skin care routine to ensure clear complexion hehe ...And my first step is to change what I use to products I can really count on, hello korean products! Hi. Which exfoliant were you using? Coz I currently use Maxi Peel Exfoliant 3 along with this instead of Maxi-Peel's moisturizing cream. Do you think using a product of a different brand would be fine for my skin? Thanks in advance!